The backpack is equipped with a 10W solar panel and an external USB charging interface to charge a power bank or mobile devices. The backpack is great for school, traveling, camping, and hiking. With the anti-theft solar backpack, you don't need to worry about someone stealing something while you wear it. 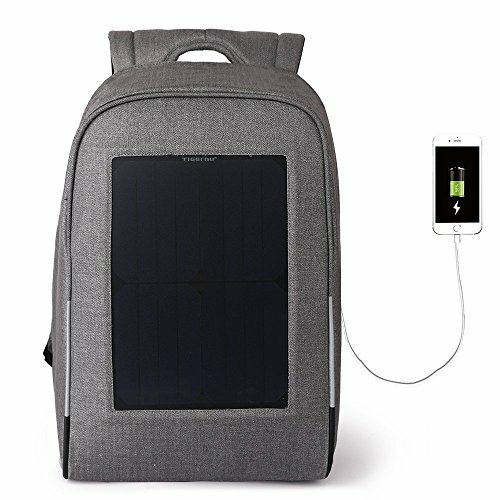 The anti-theft solar backpack has a hidden anti-theft zipper for the main compartment, this makes it hard to find, making it harder to steal things from the backpack. The backpack is water repellent, it's made of tear and scratch resistant oxford fabric which is water resistant. The water can be wiped away within 5-10 minutes for easy and dry clean-up. Note that is not, suitable to be exposed in heavy rain or water for a long period of time. Laptop compartment fit up to 15.6" laptop. With multi-functional compartments it can hold clothes, mobile devices, sunglasses, and notebooks. The backpack is designed to open 90 to 180 degrees. Made of great quality fabric, water-repellent and durable. The backpack is equipped with a high-density nylon rain cover located in the bottom compartment on the backpack. Manufacturer: Guangzhou Tigernu Leather Co., Ltd. Publisher: Guangzhou Tigernu Leather Co., Ltd. Studio: Guangzhou Tigernu Leather Co., Ltd. If you have any questions about this product by TIGERNU, contact us by completing and submitting the form below. If you are looking for a specif part number, please include it with your message.